Download "Information Governance Strategy Includes Information risk & incident management methodology"
6 on knowing what information is held (information assets), where it comes from and where it goes to (information flows) and managing times when it is unavailable (business continuity) o Deliverables regular risk reviews of systems, processes as part of the annual assurance and improvement work plan for information governance. Annual reviews of the security of key information assets and information flows will be undertaken to ensure security is achieved and maintained as far as possible. 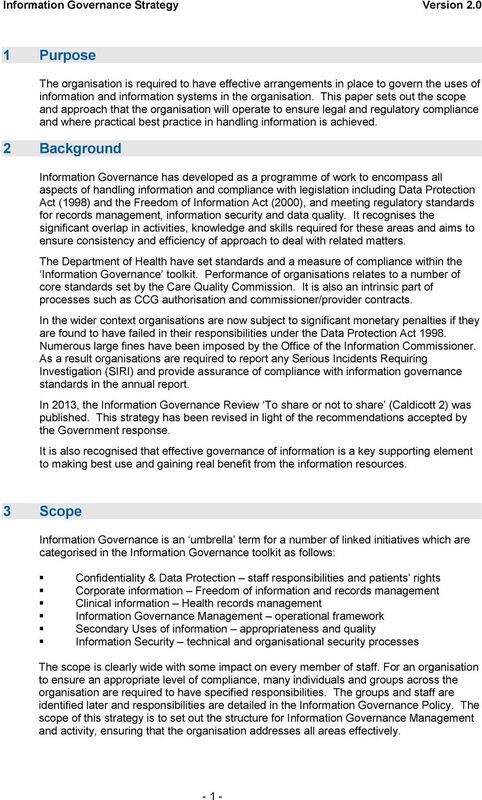 There are also significant work programmes in other areas that support Information Governance compliance, namely: Data Quality work linked to performance, contract monitoring and secondary uses of data extracted from the patient record. This also incorporates work to ensure that the use of Patient Confidential Data (PCD) is controlled appropriately within the framework of Accredited Safe Havens and Controlled Environment for Finance (CEfF). 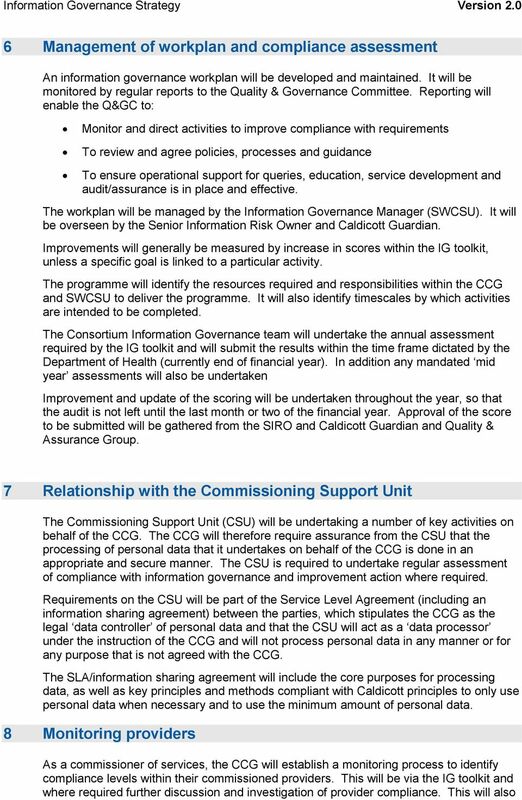 An annual workplan for assurance and improvement will be established as part of the end of year IG toolkit compliance assessment - see section 6 for more detail. 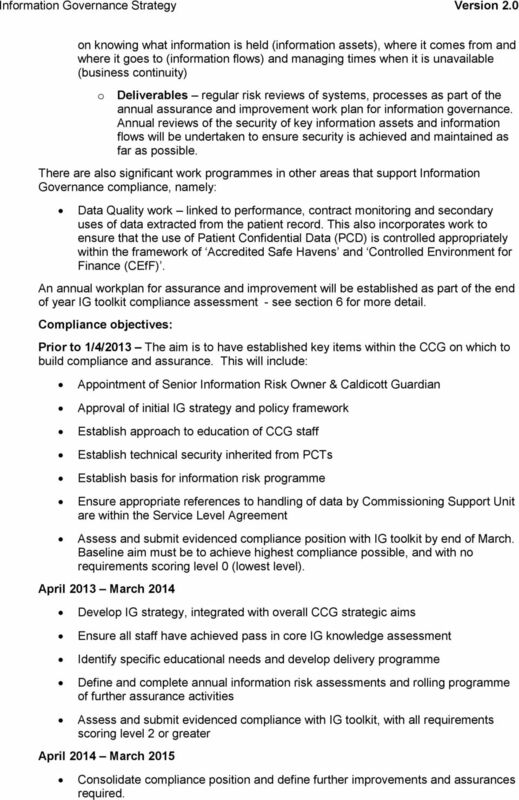 Compliance objectives: Prior to 1/4/2013 The aim is to have established key items within the CCG on which to build compliance and assurance. This will include: Appointment of Senior Information Risk Owner & Caldicott Guardian Approval of initial IG strategy and policy framework Establish approach to education of CCG staff Establish technical security inherited from PCTs Establish basis for information risk programme Ensure appropriate references to handling of data by Commissioning Support Unit are within the Service Level Agreement Assess and submit evidenced compliance position with IG toolkit by end of March. Baseline aim must be to achieve highest compliance possible, and with no requirements scoring level 0 (lowest level). April 2013 March 2014 Develop IG strategy, integrated with overall CCG strategic aims Ensure all staff have achieved pass in core IG knowledge assessment Identify specific educational needs and develop delivery programme Define and complete annual information risk assessments and rolling programme of further assurance activities Assess and submit evidenced compliance with IG toolkit, with all requirements scoring level 2 or greater April 2014 March 2015 Consolidate compliance position and define further improvements and assurances required. 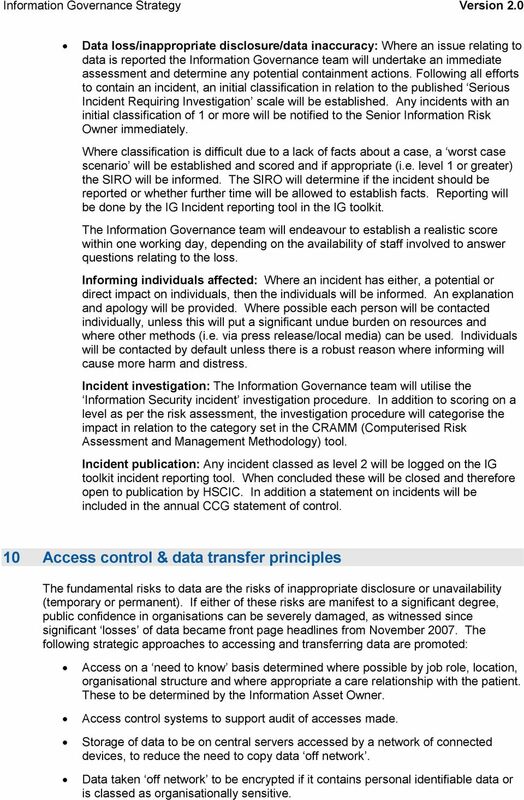 10 has been undertaken by the information governance team, a report will be produced and any risks included on the risk register until they have been reduced. Investigation of an incident or near miss as with the process to manage incidents the risk will be assessed and reduction actions planned. The process will see the risk reported to the Risk Manager for inclusion in the risk register. 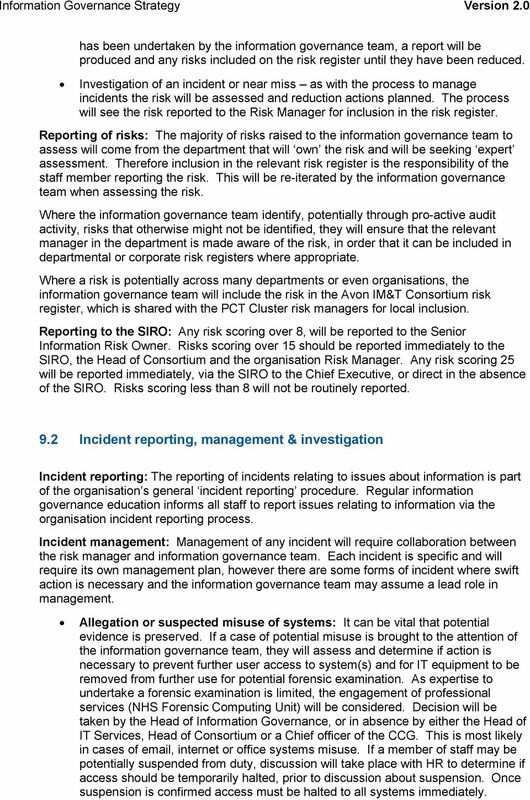 Reporting of risks: The majority of risks raised to the information governance team to assess will come from the department that will own the risk and will be seeking expert assessment. Therefore inclusion in the relevant risk register is the responsibility of the staff member reporting the risk. This will be re-iterated by the information governance team when assessing the risk. 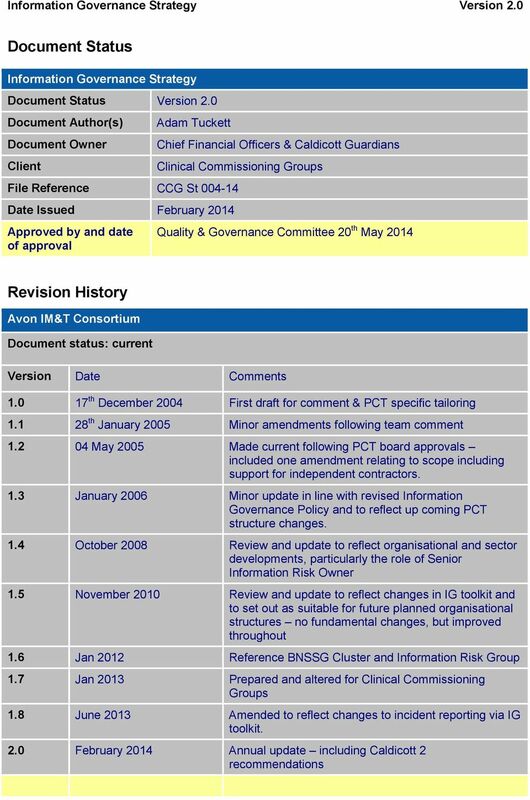 Where the information governance team identify, potentially through pro-active audit activity, risks that otherwise might not be identified, they will ensure that the relevant manager in the department is made aware of the risk, in order that it can be included in departmental or corporate risk registers where appropriate. 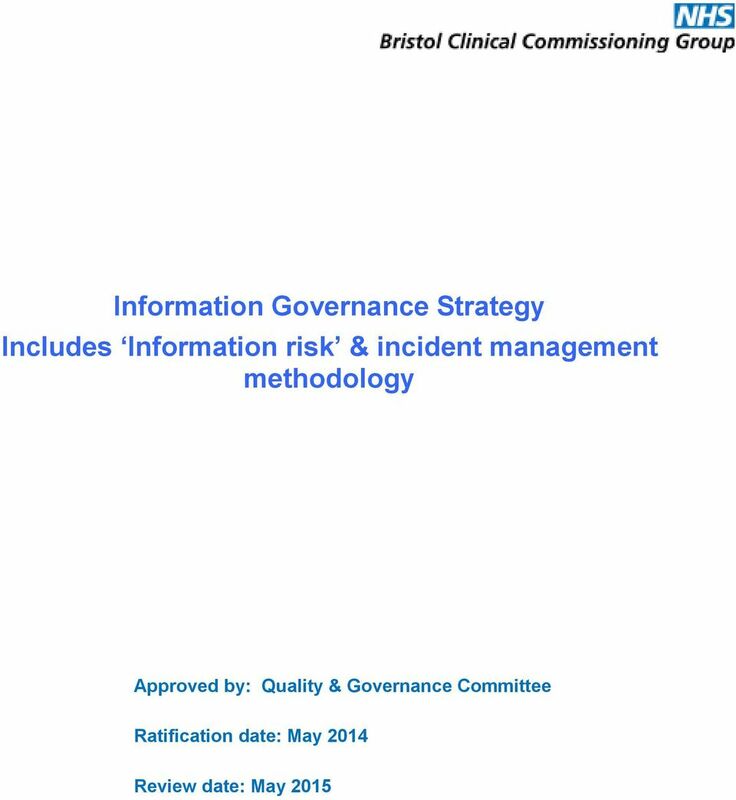 Where a risk is potentially across many departments or even organisations, the information governance team will include the risk in the Avon IM&T Consortium risk register, which is shared with the PCT Cluster risk managers for local inclusion. Reporting to the SIRO: Any risk scoring over 8, will be reported to the Senior Information Risk Owner. Risks scoring over 15 should be reported immediately to the SIRO, the Head of Consortium and the organisation Risk Manager. Any risk scoring 25 will be reported immediately, via the SIRO to the Chief Executive, or direct in the absence of the SIRO. Risks scoring less than 8 will not be routinely reported. 9.2 Incident reporting, management & investigation Incident reporting: The reporting of incidents relating to issues about information is part of the organisation s general incident reporting procedure. Regular information governance education informs all staff to report issues relating to information via the organisation incident reporting process. Incident management: Management of any incident will require collaboration between the risk manager and information governance team. Each incident is specific and will require its own management plan, however there are some forms of incident where swift action is necessary and the information governance team may assume a lead role in management. Allegation or suspected misuse of systems: It can be vital that potential evidence is preserved. If a case of potential misuse is brought to the attention of the information governance team, they will assess and determine if action is necessary to prevent further user access to system(s) and for IT equipment to be removed from further use for potential forensic examination. As expertise to undertake a forensic examination is limited, the engagement of professional services (NHS Forensic Computing Unit) will be considered. 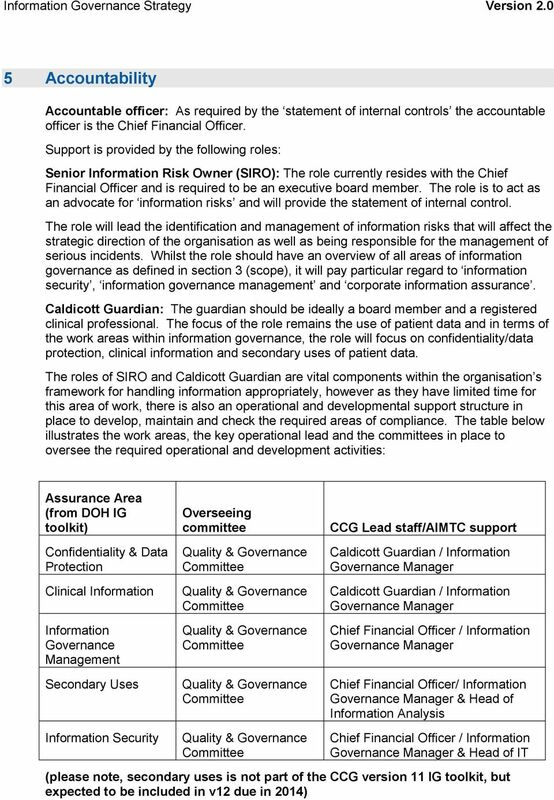 Decision will be taken by the Head of Information Governance, or in absence by either the Head of IT Services, Head of Consortium or a Chief officer of the CCG. This is most likely in cases of , internet or office systems misuse. If a member of staff may be potentially suspended from duty, discussion will take place with HR to determine if access should be temporarily halted, prior to discussion about suspension. Once suspension is confirmed access must be halted to all systems immediately. 11 Data loss/inappropriate disclosure/data inaccuracy: Where an issue relating to data is reported the Information Governance team will undertake an immediate assessment and determine any potential containment actions. Following all efforts to contain an incident, an initial classification in relation to the published Serious Incident Requiring Investigation scale will be established. Any incidents with an initial classification of 1 or more will be notified to the Senior Information Risk Owner immediately. Where classification is difficult due to a lack of facts about a case, a worst case scenario will be established and scored and if appropriate (i.e. level 1 or greater) the SIRO will be informed. The SIRO will determine if the incident should be reported or whether further time will be allowed to establish facts. Reporting will be done by the IG Incident reporting tool in the IG toolkit. The Information Governance team will endeavour to establish a realistic score within one working day, depending on the availability of staff involved to answer questions relating to the loss. Informing individuals affected: Where an incident has either, a potential or direct impact on individuals, then the individuals will be informed. An explanation and apology will be provided. Where possible each person will be contacted individually, unless this will put a significant undue burden on resources and where other methods (i.e. via press release/local media) can be used. Individuals will be contacted by default unless there is a robust reason where informing will cause more harm and distress. Incident investigation: The Information Governance team will utilise the Information Security incident investigation procedure. 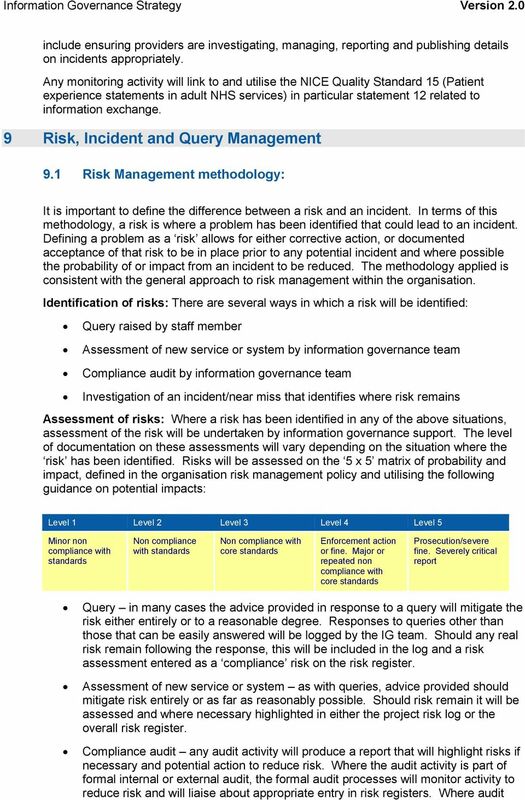 In addition to scoring on a level as per the risk assessment, the investigation procedure will categorise the impact in relation to the category set in the CRAMM (Computerised Risk Assessment and Management Methodology) tool. Incident publication: Any incident classed as level 2 will be logged on the IG toolkit incident reporting tool. When concluded these will be closed and therefore open to publication by HSCIC. In addition a statement on incidents will be included in the annual CCG statement of control. 10 Access control & data transfer principles The fundamental risks to data are the risks of inappropriate disclosure or unavailability (temporary or permanent). If either of these risks are manifest to a significant degree, public confidence in organisations can be severely damaged, as witnessed since significant losses of data became front page headlines from November The following strategic approaches to accessing and transferring data are promoted: Access on a need to know basis determined where possible by job role, location, organisational structure and where appropriate a care relationship with the patient. These to be determined by the Information Asset Owner. Access control systems to support audit of accesses made. Storage of data to be on central servers accessed by a network of connected devices, to reduce the need to copy data off network. Data taken off network to be encrypted if it contains personal identifiable data or is classed as organisationally sensitive. 14 Screensavers Sessions at team/department meetings on request (or as result of incident resolution) Use of products such as the National (CfH) IG training tool, that provide on line learning opportunities. It is noted that the current modules may well be suitable for staff who have specific additional responsibilities, such as the Senior Information Risk Owner and the Information Asset Owners. 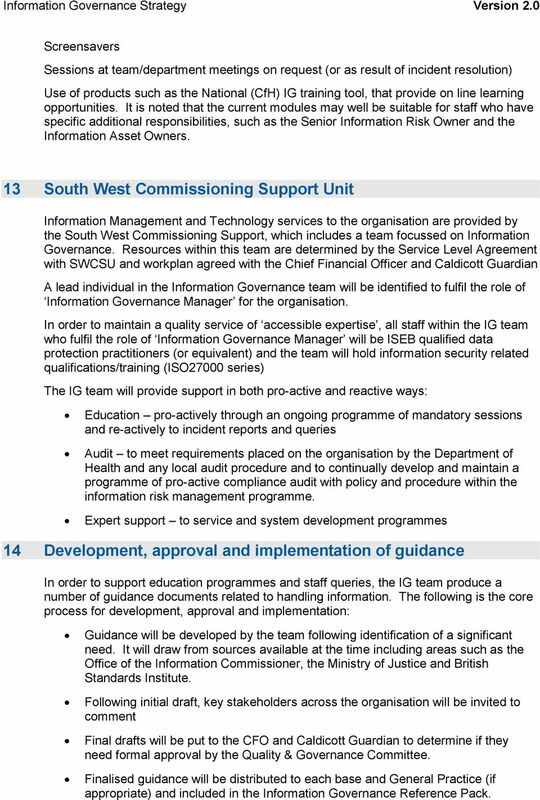 13 South West Commissioning Support Unit Information Management and Technology services to the organisation are provided by the South West Commissioning Support, which includes a team focussed on Information Governance. Resources within this team are determined by the Service Level Agreement with SWCSU and workplan agreed with the Chief Financial Officer and Caldicott Guardian A lead individual in the Information Governance team will be identified to fulfil the role of Information Governance Manager for the organisation. In order to maintain a quality service of accessible expertise, all staff within the IG team who fulfil the role of Information Governance Manager will be ISEB qualified data protection practitioners (or equivalent) and the team will hold information security related qualifications/training (ISO27000 series) The IG team will provide support in both pro-active and reactive ways: Education pro-actively through an ongoing programme of mandatory sessions and re-actively to incident reports and queries Audit to meet requirements placed on the organisation by the Department of Health and any local audit procedure and to continually develop and maintain a programme of pro-active compliance audit with policy and procedure within the information risk management programme. Expert support to service and system development programmes 14 Development, approval and implementation of guidance In order to support education programmes and staff queries, the IG team produce a number of guidance documents related to handling information. The following is the core process for development, approval and implementation: Guidance will be developed by the team following identification of a significant need. It will draw from sources available at the time including areas such as the Office of the Information Commissioner, the Ministry of Justice and British Standards Institute. Following initial draft, key stakeholders across the organisation will be invited to comment Final drafts will be put to the CFO and Caldicott Guardian to determine if they need formal approval by the Quality & Governance Committee. 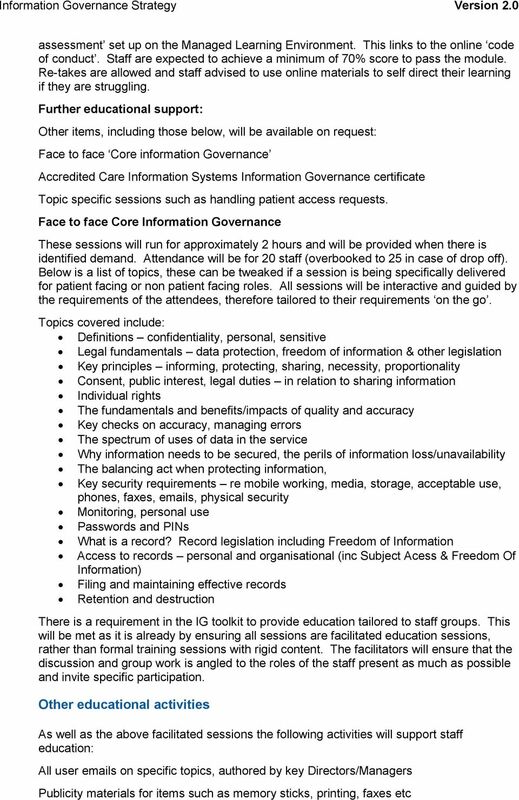 Finalised guidance will be distributed to each base and General Practice (if appropriate) and included in the Information Governance Reference Pack. 15 Adam Tuckett February 2014 Awareness will be raised via management channels, as appropriate to the subject and any degree of urgency. Methods will include induction and mandatory education sessions and all staff communications. If required a specific awareness/implementation programme will be established, the need will be determined by the Information Governance Steering Group. 1.5 The Information Governance Policy should be read in conjunction with the Information Governance Strategy. 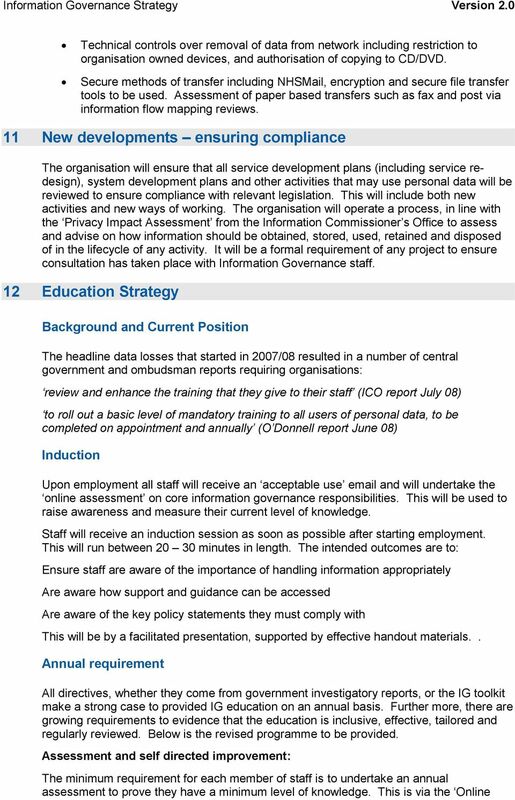 Information Governance Plan 2013 2015 1. Overview 1.1 Information is a vital asset, both in terms of the clinical management of individual patients and the efficient organisation of services and resources. All CCG staff. This policy is due for review on the latest date shown above. After this date, policy and process documents may become invalid. Information Governance Policy. 2 RESPONSIBLE PERSON: Steve Beeho, Head of Integrated Governance. All CCG-employed staff. 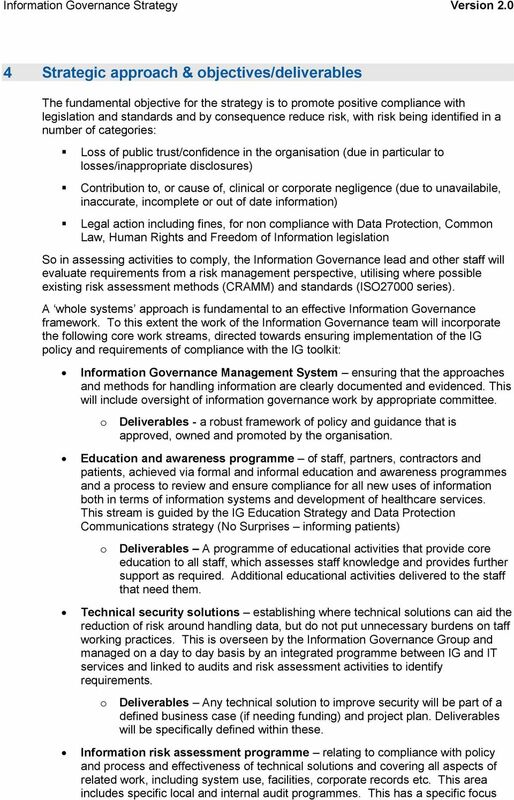 INFORMATION GOVERNANCE STRATEGY NO.CG02 Applies to: All NHS LA employees, Non-Executive Directors, secondees and consultants, and/or any other parties who will carry out duties on behalf of the NHS LA. Align Technology. Data Protection Binding Corporate Rules Processor Policy. 2014 Align Technology, Inc. All rights reserved.